The Power Saver Mode is a great feature for transformer based Inverter Charger which usually draws a high current from batteries when left idle. There are two different working statuses for Sigineer Power’s inverter chargers: “Power On” and “Power Off”. When power switch is in “Unit Off” position, the inverter is powered off. 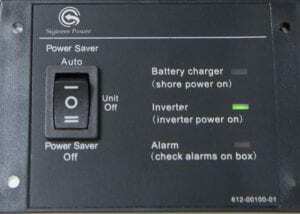 When power switch is turned to either of “Power Saver Auto” or “Power Saver Off”, the inverter is powered on. Power saver function is to dedicated to conserve battery power when AC power is not or little required by the loads. In this mode, the inverter pulses the AC output looking for an AC load (i.e., electrical appliance). Whenever an AC load (greater than 25 watts) is turned on, the inverter recognizes the need for power and automatically starts inverting and output goes to full voltage. When there is no load (or less than 25 watts) detected, the inverter automatically goes back into search mode to minimize energy consumption from the battery bank. In “Power saver on” mode, the inverter will draw power mainly in sensing moments, thus the idle consumption is significantly reduced. The inverter is factory defaulted to detect load for 250ms in every 3 seconds. This power sensing can be customized to “Unit off charging” via the SW3 on DIP switch. Note: The minimum power of a load to take inverter out of sleep mode (Power Saver On) is 25 Watts. Note: The minimum power of a load to take inverter out of sleep mode (Power Saver On) is 50 Watts. For split phase models, the power threshold of sleep mode is 50W between Hot1 and Neutral and 200W between Hot 1 and Hot 2. There is no load detection between Hot2 and Neutral. The whole inverter is designed with extraordinarily low idle power consumption which is approximately 0.8-1.8% of its rated power. When in the search sense mode, the green power LED will blink and the inverter will make a ticking sound. At full output voltage, the green power LED will light steadily and the inverter will make a steady humming sound. When the inverter is used as an “uninterruptible” power supply the search sense mode function should be defeated. Some devices when scanned by the load sensor cannot be detected. Small fluorescent lights are the most common example. (Try altering the plug polarity by turning the plug over.) Some computers and sophisticated electronics have power supplies that do not present a load until line voltage is available. When this occurs, each unit waits for the other to begin. To drive these loads either a small companion load must be used to bring the inverter out of its search mode, or the inverter may be programmed to remain at full output voltage. Note: For split phase models, the power saver functionality is only available on Hot 1. Under the Battery Priority Mode (SW5 in position “1”), the inverter can be switched between two modes: Power Saver Mode (SW3 in position “1”) and Unit Off Charging Mode (SW3 in position “0”). The power Switch should be in “Power saver on” position all the time for using these functions. In Power Saver Mode, the inverter is initially in standby mode and sends a pulse to detect the presence of a load every 3 seconds. Each pulse lasts for 250ms. The inverter will remain in standby mode until a load has been detected. Then it will wake up from standby mode and start to invert electricity from the battery bank to supply the load. As this function is under Battery Priority, the inverter will always prefer to invert electricity from battery first even there is a qualified AC input present. Only when the battery voltage is lower than the low voltage alarm point, will the inverter switch to AC input power to charge the battery and supply the load at the same time. This Power Saver Mode can be changed to Unit Off Charging mode via SW3 by switching it to “0” position. (SW5 still in “1”). Be The First to Review the Sigineer Power Inverter Charger, Win a $100 Coupon !